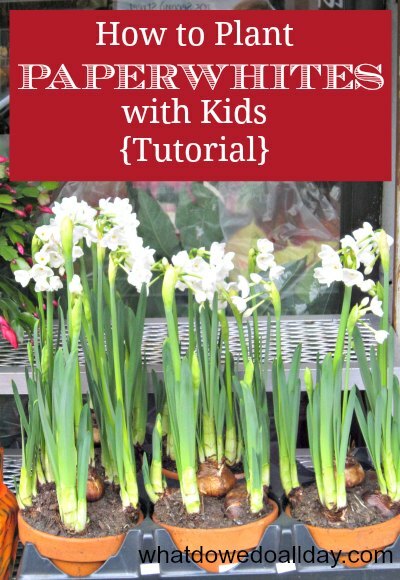 Every year the kids and I plant paperwhite bulbs indoors. When the blooms open they fill the apartment with a heady fragrance. Many paperwhite enthusiasts time their plantings to bloom at Christmas, but I also like to plant them later. Their blooms are the perfect pick-me-up for droopy, gloomy January days. Paperwhites are perfect for the indoor gardening novice. They rarely fail to bloom and unlike other bulbs, they do not need to be pre-chilled. There are two ways to plant them: in pebbles or in soil. Containers — if you plan on using stones, chose jars with a wide mouth and no drainage hole. If you are using soil, your container must have a drainage hole to prevent rot. Growing medium — either stones or soil. You could also use colored glass stones, which would be gorgeous. 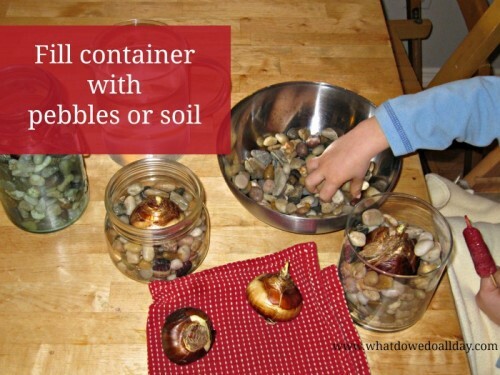 Step one: Fill containers with stones (or soil) at least 3 inches. The roots will need some space to grow but relatively shallow containers are fine. A large round dish filled with multiple bulbs would be very pretty! Step two: Nestle each bulb slightly into the stones so they are stable and add a few extra stones around the edges. If you are using soil, fill so that the top half of the bulb is above the soil line. 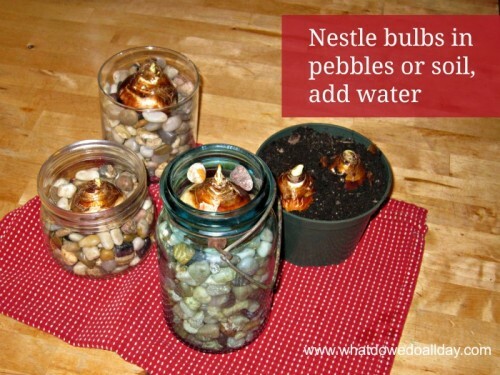 Step three: If using pebbles, add water until the very bottom of the bulb is wet, but no more or the bulbs will rot. With soil, add water until evenly moist. 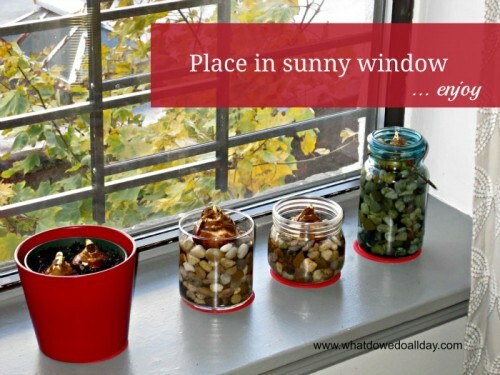 Step four: Place bulbs in a sunny, warm window. Roots will start to appear in 1-2 weeks and the tops will begin to sprout about the same time. Blooms will grace your living space about one month later. Step five: If using stones, check water level every other day or daily if the air in your home is especially dry. You want the water to keep the roots, but not the bulb, wet. If you planted the bulbs in soil you just need to water as soon as the soil feels dry. By far the hardest part of apartment living is not having a yard because I absolutely love to garden. Fortunately there are a variety of indoor plants that my kids and I can grow. Taking care of plants (even indoors) teaches kids responsibility; it gives them a sense of pride and accomplishment to see plants thrive. 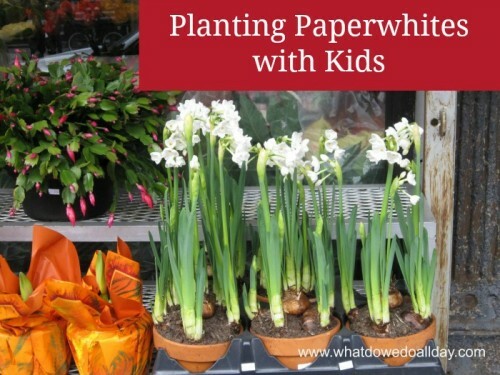 Perfect book to go along with this activity is Paperwhite. Cut paper collages follow the story of a girl bunny who plants paperwhites and eagerly watches their progress. I bought the stones at IKEA, but you can also find them at craft stores or online. My favorite resources for bulbs are Old House Gardens Heirloom Bulbs and Brent and Becky’s Bulbs, but most hardware and gardening centers will also carry paperwhites in the fall and early winter. I’ve been collecting more indoor and tiny space gardening ideas on my pinterest board and you can follow me there. Very interesting – I’ve never heard of paperwhites before. One thing our house doesn’t have is sunny windows, but I am pretty sure we can try it outside too. I love the idea of doing a journal! Thanks for sharing this. 🙂 I featured this post on this week’s kid’s co-op. You can find it here. I was checked out of blog land and missed this great post! I love the containers you used. They would make great gifts. Kelly, I frequently check out of blog land!! what a great project, can’t wait to do this with my kiddos! And it makes the house look lovely! Paperwhites are so beautiful! And planting the bulbs over stones is a cute idea I didn’t know they’re able to grow that way. This spring me and my daughter planted some bulbs in the garden and she was very curious watching the Paperwhites growing day by day. We should plant few over stones, I’m sure this will be more interesting for Ruby, because she’ll be able to see what’s happening with the bulb all the time. Thank you for the idea!